This appetizer combines two of my favorite things - farm fresh food and eggs from our girls! Asparagus dipped in homemade mayonnaise made from the eggs of our backyard chickens - I cannot think of a better way to celebrate the beginning of harvest bounty beginning to descend upon us. Asparagus is wonderful for all sorts of reasons: it tastes amazing, when it leafs out the fronds are soft and silky like baby hair, and when you prepare it there is snapping involved. I did not realize until I was in college that not everyone snaps asparagus. I was taught to bend the cut stalk until it snaps - the area where it snaps will be the demarcation of where it is still chewable and where it will become stringy and difficult to eat. 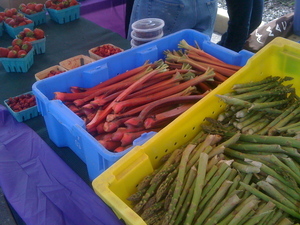 I was able to find glowing asparagus at Seedling's booth at the Westside Farmers Market. Seedling is located in South Haven, MI and they focus mainly on fruit. 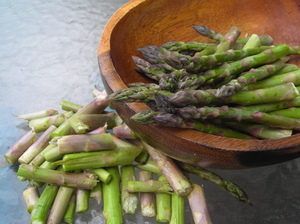 However, I had heard Locavorious was procuring asparagus from Seedling for their CSA and I was curious to try. So I sat outside and snapped my way through a large handful - the leftover stalks to be divided equally between our chickens and to feed our vermiculture container inside the house (those worms are always hungry). After snapping, I steamed the asparagus for 4 minutes and quickly ran them under cold water to stop them from continuing to cook. Then I pulled out from the refrigerator our second attempt at making mayonnaise. It seemed silly for us to be purchasing mayonnaise (one of my most favorite indulgences) when we have an abundant and never-ending supply of eggs. I was able to corner a family member to give me his recipe over Easter. His recipe is simple and elegant in its simplicity. JP’s mayonnaise recipe: Two egg yolks, two cups of oil, juice of one full lemon, 2 tablespoons water, some white pepper, and a sprinkle of cayenne pepper to taste. When we returned home we tried another recipe for mayonnaise that we found in our fancy book of egg recipes, Eggs, by Michel Roux. His recipe calls for Dijon mustard and white wine vinegar OR lemon juice, we went with the white wine vinegar. Roux’s mayonnaise recipe: 2 egg yolks, 1 tbsp Dijon mustard, salt and freshly ground pepper, 1 cup peanut oil, 2 tbsp white wine vinegar/lemon juice. Place into a bowl on a towel the egg yolks, mustard, salt, and pepper. Whisk. Slowly add a trickle of oil while you whisk. Once the mixture begins to thicken add the oil in a steady stream, whisking the whole time. Once the oil is incorporated, continue to whisk briskly for 30 seconds and then add the vinegar/lemon juice. First of all, I used our manual blender and the mixture refused to thicken when I started adding the oil. Our hand-held electric blender worked much better and the mixture began to thicken - but the splattering was considerable (note the Mason jar in JP's recipe). Taste wise, when I think of my ideal mayonnaise flavor, I prefer JP's recipe. The addition of mustard in the Roux's recipe adds an element of non-mayo that alters the essence of the mayonnaise flavor. 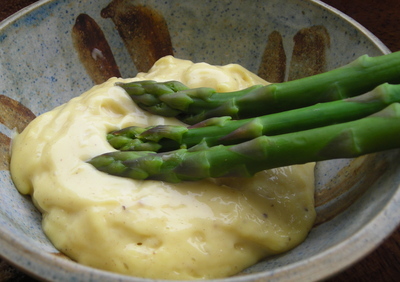 But the mustard-esque mayonnaise is a beautiful dunk for freshly cooked asparagus - it gives it a certain bite that offsets the grassy flavor of the green stalks.